PURCHASE AND SALE AGREEMENT (this “Agreement”), dated as of _________________ by and between, RETAIL CENTER OWNER, each having an office at ____________________________ (“Seller”), and RETAIL CENTER PURCHASER LLC, having an office c/o ____________________ (“Purchaser”). Purchaser has agreed to purchase the Property and other assets to be conveyed hereunder in their “AS-IS, WHERE-IS, WITH ALL FAULTS” condition and acknowledges that, except as expressly set forth in this Agreement, including without limitation those contained in Section 6 (a) hereof, Seller has made no representations or warranties to Purchaser regarding the Property and other assets. (a) The Property. Seller agrees to sell to convey to Purchaser, and Purchaser agrees to purchase from Seller, at the price, upon the terms and subject to the conditions set forth in this Agreement, (i) the Parcel; (ii) the Improvements; (iii) all of Seller's right, title and interest in and to the easements, rights of way, reservations, covenants, restrictions, privileges, appurtenances, development rights, underground rights, water rights and other estates and rights, if any, pertaining to the Parcel and the Improvements; (iv) all right, title and interest in and to all equipment, fixtures, inventory and other tangible personal property owned by Seller located on and used in connection with the operation of the Parcel and the Improvements as a retail mall complex, including such items as are listed in Schedule 1(a)(iv) (collectively, the “Personal Property”), but excluding the items of personal property described in Section 1(b); (v) all right, title and interest, if any, in and to any strips and gores, alleys adjoining the Parcel, and the land lying in the bed of any street, road or avenue, opened or proposed, in front of or adjoining the Parcel to the center line thereof; (vi) the interest of Seller as landlord in all leases, licenses and other occupancy agreements encumbering the Property on the Closing Date (collectively, the “Leases”); (vii) the service, supply, maintenance, utility and commission agreements, and equipment leases with respect to the Property (collectively, the “Service Contracts”), to the extent assignable; (viii) the licenses, permits, certificates, approvals, authorizations, variances and other written authorizations from any governmental or quasi-governmental authorities having jurisdiction necessary or desirable for the use, operation or ownership of the Property and in the possession or control of Seller (collectively, the “Permits”), to the extent assignable; (ix) all right, title and interest in plans and specifications in the possession and control of Seller for the Improvements (collectively, the “Plans”), to the extent assignable; and (x) all right, title and interest in warranties in the possession or control of Seller for such Improvements, to the extent assignable. (b) Excluded Property. Specifically excluded from the Property and this sale are all items of personal property described in Schedule 1(b), if any. (ii) By Buyer paying on the Closing Date, by wire transfer to one or more accounts designated by Seller, the amount of the Purchase Price less the Deposit. (a) Real Estate and Personal Property Taxes. Real estate and personal property taxes shall be prorated for the calendar year or fiscal year, as the case may be, for which such taxes are assessed. Such proration shall be calculated based upon the actual number of days in such calendar year or fiscal year, as the case may be, with Seller being responsible for that portion of such calendar or fiscal year occurring prior to midnight of the day prior to the Closing Date and Purchaser being responsible for that portion of such calendar or fiscal year occurring on and after the Closing Date. All prorations shall be based upon the actual tax assessed and any discounts or penalties shall inure to the benefit of, or be borne by, Seller. If the real estate and/or personal property tax rate and assessments have not been set for the calendar or fiscal year in which the Closing occurs, then the proration of such taxes shall be based upon the rate and assessments for the preceding calendar or fiscal year, and such proration shall be adjusted between Seller and Purchaser upon presentation of written evidence that the actual taxes paid for the calendar or fiscal year in which the Closing occurs differ from the amounts used at Closing in accordance with the provisions of Section 3(g). 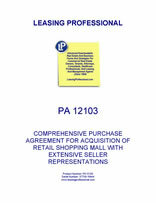 Seller shall pay all installments of special assessments due and payable prior to the Closing Date and Purchaser shall pay all installments of special assessments due and payable on and after the Closing Date; provided, however, that Seller shall not be responsible for any installments of special assessments which have not been finally assessed (even if Seller shall have received notice that such an assessment is contemplated) or which relate to projects that have not been completed on the date hereof. (b) Rents. All collected rents and other payments from tenants, licensees or other occupants under the Leases shall be prorated between Seller and Purchaser as of midnight on the day prior to the Closing Date. Seller shall be entitled to all rents, charges, and other revenue of any kind attributable to any period under the Leases to but not including the Closing Date. Purchaser shall be entitled to all rents, charges and other revenue of any kind attributable to any period under the Leases on and after the Closing Date. Minimum rent, percentage only rent and additional rent shall be prorated for the month in which Closing occurs. Percentage rent (as contrasted to percentage only rent) shall be apportioned on a Lease-by-Lease basis as follows: (i) subject to the balance of this subparagraph, Seller shall retain all percentage rent payments received by it on and prior to the Closing Date and Purchaser shall retain all percentage rent payments received by it after the Closing Date; (ii) on the Closing Date, Seller shall deliver to Purchaser a statement of all percentage rent collected by Seller with respect to the Subject Lease Year on a Lease-by-Lease basis along with a copy of the percentage rent invoices and sales reports which support those collections; (iii) for each Lease, not later than forty-five (45) days after the date that gross sales for the Subject Lease Year are finally determined, Purchaser shall deliver to Seller a statement of all percentage rent collected by Purchaser with respect to that Lease along with a copy of the annual reconciliation of percentage rent owed under the applicable Lease for the Subject Lease Year and the related sales information backup; and, (iv) for each Lease, within fifteen (15) days after the date the statement and reconciliation described in subsection (iii) above is delivered to Seller, Purchaser shall pay to Seller or Seller shall pay to Purchaser, whichever is applicable, the positive difference between (A) the total percentage rent collected by that party with respect to the Subject Lease Year and (B) the product of (1) the average daily percentage rent received with respect to the Subject Lease Year after taking into account the annual reconciliation and (2) the actual number of days that party was the Owner of the Property during the Subject Lease Year (with Purchaser being deemed to be the owner as of the Closing Date). As used herein, the term "Lease Year" means the twelve (12) month period as to which annual percentage rent is owed under each Lease and “Subject Lease Year” means, for each Lease, the Lease Year in which the Closing Date occurs. Seller shall be entitled to continue or commence audits of percentage rent and percentage only rent under the Leases for the Lease Year immediately prior to the Subject Lease Year, and shall have the right to settle the same in its sole discretion. Rents, CAM charges, utility charges, tax charges and other revenue or reimbursements due landlord under the Leases not collected as of the Closing Date shall not be prorated at the time of Closing, but for a period of twelve (12) months after the Closing Date, Purchaser shall make a reasonable, good faith effort to collect the same on Seller's behalf by invoicing delinquent tenants on a monthly basis for all past due amounts (which obligation shall survive the Closing and shall not be merged in the Deed); provided, however, that Purchaser shall have no obligation (unless Purchaser elects in its sole discretion) to enforce its rights under the Leases in a court of law or equity, to threaten such enforcement, or to commence any action or proceeding whatsoever to enforce its rights under the Leases. All rents, CAM charges, utility charges, tax charges and other reimbursements due landlord under the Leases collected by Purchaser on or after the Closing Date shall first be applied to all amounts due under the Leases at the time of collection for periods from and after the Closing Date (i.e., current rents and any other sums due Purchaser as the current Owner and landlord), next to the actual costs incurred by Purchaser to third parties in collecting these amounts, with the balance (if any) payable to Seller promptly upon receipt for rents and any other sums due prior to the Closing Date, to be applied in reverse chronological order of the date on which same became due. Seller may not bring suit against any such tenant to collect any such sums unless the tenant is a tenant in other shopping centers owned by Seller or an affiliate of Seller, in which case Seller shall be permitted to bring suit against that tenant. In no event shall Seller seek or threaten eviction of any tenant in the Property. Purchaser shall receive a credit against the Purchase Price for pre-paid rentals held by Seller covering the period post-Closing. Advertising or marketing funds collected by Seller prior to Closing, net of expenses not assumed by Purchaser, will be credited against the Purchase Price at Closing. Notwithstanding anything herein to the contrary, Seller shall retain all rights and claims against tenants and former tenants in bankruptcy which are no longer in possession at the Property. (c) Operating Expenses. Operating expenses for the Property shall be prorated as of 11:59 p.m. of the day prior to the Closing Date. Seller shall pay all utility charges and other operating expenses attributable to the Property (such as amounts due under the Service Contracts) to, but not including the Closing Date, and Purchaser shall pay all utility charges and other operating expenses attributable to the Property on or after the Closing Date. To the extent that the amount of actual utility consumption, other operating expenses or revenues are not determined prior to the Closing Date, a proration shall be made at Closing based on the last available reading, in the case of utility consumption, or on the last bill or receipt, and post-Closing adjustments between Purchaser and Seller shall be made ninety (90) days following the Closing Date, which obligation shall survive the Closing and shall not be merged in the Deeds and Seller will be entitled to all rights with respect thereto. Seller shall not assign to Purchaser any deposits which Seller has with any of the utility services or companies servicing the Property, and Seller will be entitled to all rights with respect thereto. Purchaser shall arrange with such services and companies to have accounts opened in Purchaser's name beginning at 12:01 a.m. on the Closing Date. (d) Security Deposits. At Closing, Seller shall account to Purchaser for, and give Purchaser a credit against the Purchase Price for the Property in the aggregate amount of, the unapplied cash security deposits then held by Seller under the Leases and any interest required by law or the applicable Lease to be accrued thereon. At Closing, Purchaser shall assume liability for, and indemnify and hold Seller harmless from and against claims relating to, all unapplied cash security deposits so credited. Following Closing, Seller shall assume liability for, and indemnify and hold Purchaser harmless from and against claims relating to, any unapplied cash security deposits not so credited. If any security deposit is held in the form of a letter of credit, the original letter of credit will be assigned and delivered to Purchaser at Closing together with any other documents required to effect the transfer to Purchaser at Closing. The obligations of the parties pursuant to this Section 3(d) shall survive Closing and shall not be merged in the Deeds. (e) New Leases. At Closing, Purchaser shall reimburse Seller, or assume liability for, and indemnify and hold Seller harmless from and against, all brokerage and other costs and expenses, including without limitation, incentives, tenant improvement costs, allowances and other inducements, paid or payable on account of (i) leases entered into following the execution of this Agreement which are approved by Purchaser pursuant to Section 11(b) and (ii) renewals of existing leases. (f) Apportionment Credit. In the event the apportionments to be made at the Closing result in a credit balance (i) to Purchaser, such sum shall be paid at the Closing by giving Purchaser a credit against the Purchase Price in the amount of such credit balance, or (ii) to Seller, Purchaser shall pay the amount thereof to Seller at the Closing by wire transfer of immediately available funds to the account or accounts to be designated Seller for the payment of the Purchase Price. (g) Delayed Adjustment. If at any time following the Closing Date, any adjustment under any subsection of this Section 3 shall prove to be incorrect (whether as a result in an error in calculation or a lack of complete and accurate information as of the Closing), the party in whose favor the error was made shall promptly pay to the other party the sum necessary to correct such error upon receipt of proof of such error, provided that such proof is delivered to the party from whom payment is requested within twelve (12) months after the Closing Date for all adjustments other than the adjustment of percentage rent, which adjustment shall be made when the calculation and payment thereof has been made, and in any event, within sixteen (16) months following the Closing Date. The provisions of this Section 3(g) shall survive the Closing and shall not be merged in the Deeds. (h) Purchaser's Investigations. Purchaser shall pay for Purchaser's Investigations and any other due diligence performed by Purchaser with respect to the Property. (i) Attorneys' Fees. Purchaser and Seller shall each be responsible for paying its own attorneys', consultants' and other professionals' fees in connection with this transaction. (j) CAM Audits. Seller shall remain responsible for, and shall control, any audits of CAM charges for periods prior to the year of the Closing Date, and shall have the right to settle the same in its sole discretion. Purchaser shall cooperate with Seller to the extent required and shall make any books and records assigned hereunder available to Seller in connection with any such audit.